Trigeminal neuralgia is a condition of the fifth cranial nerve, also known as the trigeminal nerve, which transmits signals between the brain and the face, eyes, and teeth as well as the muscles that control chewing. Trigeminal neuralgia (also known as TN, or tic douloureux) is a chronic condition that causes intense facial pain, usually down one side of the face. It most commonly develops in those over 50, particularly women, but it can occur in younger people and men as well. Trigeminal neuralgia is not life-threatening, but the pain — variously described as burning, stabbing, or like an electric shock — can be severe enough to cause physical and emotional distress. Typically, when the condition first develops the pain comes and goes, with painful episodes lasting only a few seconds and with long intervals between attacks. As the condition progresses the pain becomes constant or the interval between episodes becomes shorter — sometimes only a few minutes. Sleep provides respite, but symptoms resume upon awakening. The source of the pain is the trigeminal nerve, also known as the fifth cranial nerve, or CNV. The trigeminal nerve transmits signals between the brain and the face, eyes, and teeth as well as the muscles that control chewing. (If you’ve ever experienced a “brain freeze” or "ice cream headache" from slurping a milk shake or a frozen drink, you’ve met your trigeminal nerve.) There are two trigeminal nerves, one on each side of the face, and each has three branches: the ophthalmic nerve, the maxillary nerve, and the mandibular nerve. Trigeminal neuralgia can affect any of these three, but is most commonly a condition of the maxillary and mandibular nerves. Episodes of trigeminal neuralgia may be spontaneous, or they may be triggered by mild stimulation of the face (such as shaving, applying makeup, chewing, washing, and even exposure to wind). Over time, the attacks can grow in duration, intensity, and frequency (see Symptoms of Trigeminal Neuralgia). In most patients, most of the pain comes in sudden, sharp bursts — this is considered Type 1 trigeminal neuralgia. In others, the pain is more continuous and is described as aching or burning, with sharp bursts of pain occurring intermittently — this is considered Type 2 trigeminal neuralgia. The treatment is the same regardless of the type. (See Diagnosing and Treating Trigeminal Neuralgia). There are several possible causes of trigeminal neuralgia, including ordinary aging. 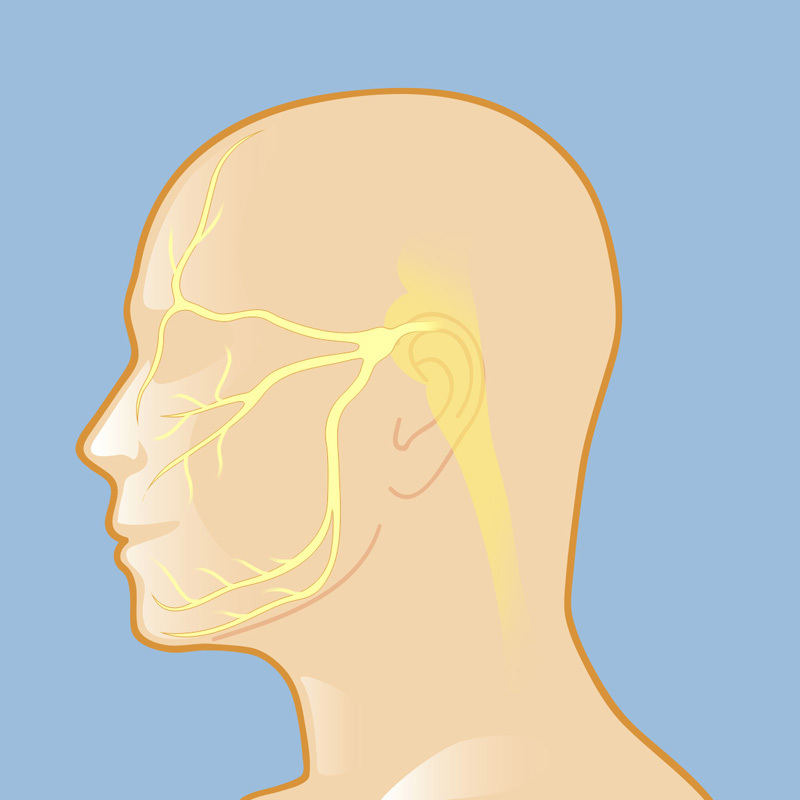 In many cases, trigeminal neuralgia is caused by an abnormal blood vessel or tumor pressing on the trigeminal nerve; the pain can also be a result of multiple sclerosis. Other possible causes are aneurysm; posterior fossa tumor, arachnoid cyst, brain stem disease resulting from a stroke, or a traumatic injury. Sometimes there is no clear cause of the pain (known as idiopathic trigeminal neuralgia), so the condition can therefore be difficult to diagnose. There are several different approaches to treating trigeminal neuralgia, depending on its cause (see Diagnosing and Treating Trigeminal Neuralgia). Reviewed by: Jared Knopman, M.D.